The Dots and Boxes iPad App is one of the latest logic iPad app that I play and enjoy very much. The game consists of a 7 x 7 rows of dots where the players connect two dots horizontally or vertically. The objective of the game is to close as many squares as you can. When you place the fourth segment in a 1 x 1 square, the square becomes yours and is filled when your color regardless of who placed the other three segments of that box. 5 iPad Apps That Will Drive You Math! Suitable for children, adolescents and adults, these iPad apps will aid any person who is struggling to remember lots formulas or suddenly runs out of paper. 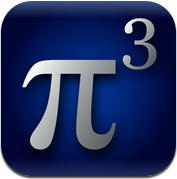 This app is available on every iOS device and belongs to the most expensive math app with a price of $9.99. Pi Cubed uses a touch-based interface that lets you enter and evaluate even the most impossible math problems. As you can expect from an app like this one, you’re able to pitch-zoom and swipe throughout the whole interface. The Core Animation framework even makes everything look fancy without being too distracting. And lots of other functions.